“Mr. 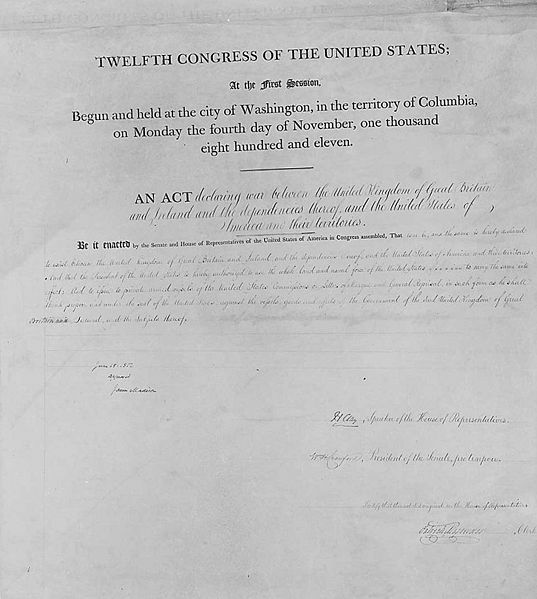 Madison’s War.” From http://en.wikipedia.org/wiki/War_of_1812, accessed August 3, 2012. To some Americans, it was a fiery necessity, the Second War for Independence. To others, it was “Mr. Madison’s War,” a terrible inconvenience that disrupted profitable New England trade. To the British, it was just another military headache; they were already fully involved in the Napoleonic Wars. No matter who called it what, men from both sides of the Atlantic were summoned to fight this war, and once the regiments were assembled they marched off to it with music from their own fifers and drummers.
. . . At this time (1811) America was preparing for war & Father immediately got work at good wages at making fifes. He was a quick worker, but worked in the old German way & could only make 1/2 doz each day, whereas an American alongside of him made a doz. Papa bored his from 2 sides; figuring this too slow, he studied out a plan to bore them from one. Soon equaled the Americans & determined to succeed, surpassed [them] and made 2 doz a day. . .
Fife rather carelessly marked “H.E.,” likely Heinrich Eisenbrandt, Philadelphia, ca 1811. Author’s Collection. It is not clear whether “Papa” and the “Americans working alongside him” were employed by any one of the Philadelphia instrument makers active at that time or in Eisenbrandt’s own shop, which he later claimed to have founded in 1811, but in any event, Eisenbrandt did not stay in Philadelphia very long. His biographer tells us of a short stint in Baltimore and another in New York before returning to Germany in 1816. He worked in the family woodwind business before winning appointment as “court instrument maker in Hanover.” However, in 1819 he was back in Baltimore and this time established a musical instrument business that would flourish for 130 years. Metzler fife, London, 1788-1815 (top), Eisenbrandt fife, Philadelphia, ca 1811 (bottom). According to The New Langwill, Eisenbrandt was in Baltimore (at the battle of North Point) in 1812 and in New York in 1815. Author’s Collection. The British side of the story is also dominated by a German whose woodwind-making enterprise lasted even longer than Eisenbrandt’s. Valentine Metzler (b.?, Bingen am Rhein, d. 1833) began his career in London in 1788 and eventually opened a “music warehouse” as well. When his son, George (b. 1797, d. 1867) joined the business in 1816, the name was changed to Metzler & Son. It then became Metzler & Co. in 1833, upon the death of the elder Metzler. In 1931 Metzler & Co. was assumed by J.B. Cramer, under whose name and leadership the company continued until about 1950. Despite their German heritage, both Metzler and Eisenbrandt turned fifes that were characteristic of their adopted countries. In fact, were it not for their brand marks, they would be nearly identical to any other contemporary British- and American-made fife respectively, less so in the case of Eisenbrandt, though, because the outstanding feature that distinguishes his work from any other is his use of rosewood.
. . . he became famous for his work. The Americans at that time knew nothing of polishing hard woods & he often received double the amount of his price when a piece of work was completed; this in fact had been the case frequently, from the very first, in Phila[delphia]. . . Foot end of Metzler fife (left) compared to foot end of Eisenbrandt fife (right). The bores are well centered. Enlarging the image demonstrates loosened areas of the Metzler ferrule. Author’s Collection. Otherwise, the straight, narrow bore and the thin-walled, tapered body with upper body swell found on Eisenbrandt fifes were typical of American fife design. Eisenbrandt drilled the bore and turned his fife with care, probably on a foot-powered lathe. The small, even tone holes are also typical of the time period. Of note, though, is Eisenbrandt’s careful undercutting of only some of the tone holes. Undercutting was a subtle way of enlarging the tone hole on the inside of the body without disturbing its appearance on the outside. When left uncovered by the fifer’s finger (“open”), the widened tone hole would effectively shorten the sounding length of any pitch dependent upon that open hole, resulting in slightly sharper intonation. By choosing which tone holes to undercut, Eisenbrandt improved specific pitches that, on other fifes, were noticeably flat. Ferrule, foot end of Eisenbrandt fife. A pincer device was used to make two equidistant indentations that would prevent ferrule loss should it loosen from its seating. However, these ferrules are so well toleranced that they show no sign of loosening even now, 200 years later. Author’s Collection. Certain other characteristics, however, show where Eisenbrandt cut corners in order to complete his 2 dozen fifes per day. The brass ferrules are nicely fitted but without decoration. He snipped them from seamless metal tubing, which took a lot less time than cutting up brass sheets, hand-rolling each ferrule to fit the fife, and then finishing with a burnished seam, which is what other makers did. Both ferrules are the same size (3/4”), thus eliminating the necessity of turning different seating lengths at each end of the fife, even though it was standard practice at this time to apply a longer ferrule at the foot end. 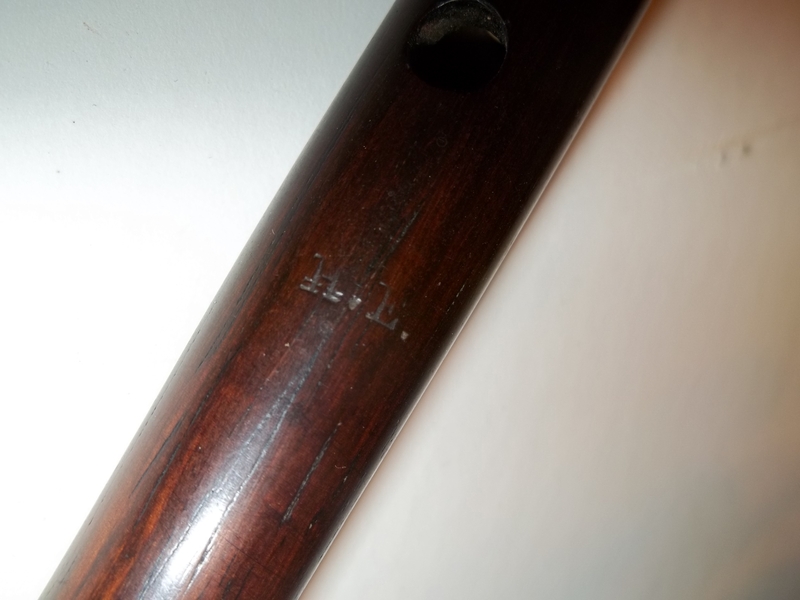 On this particular instrument, his brand mark, a seriffed “H.E.,” missed the midline entirely and is only partially visible despite being double-struck. Perhaps he excused his haste or inattention to such details, which did not affect either intonation or gross appearance, because it allowed him to tend more carefully to other characteristics that did, the overall result being a well-constructed instrument that exceeds the standards of its day. Brand mark used by Valentine Metzler, 1788-1815. Author’s Collection. 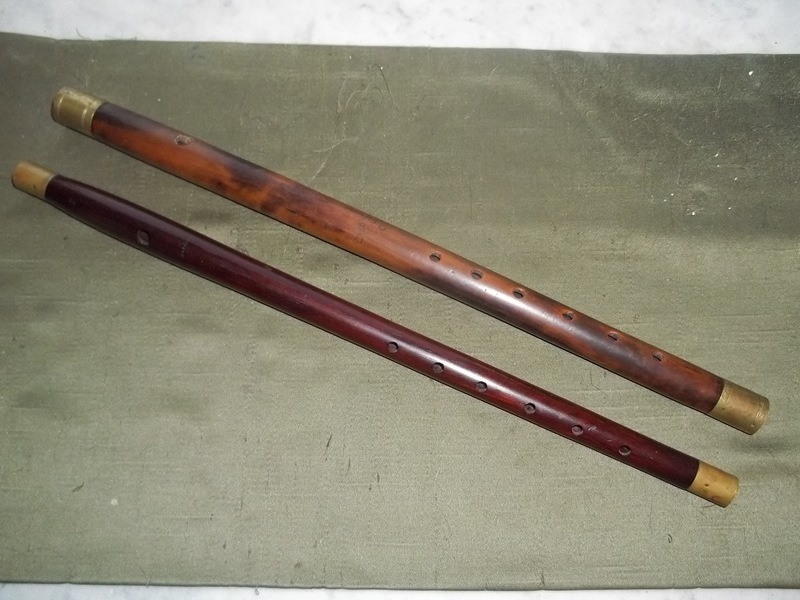 The Valentine Metzler fife is a typical British instrument. He, too, was a talented woodwind maker, but unlike Eisenbrandt, whose fifes equaled the quality of his other woodwinds, Metzler viewed fifes as a secondary product. Rather than improve upon them, his fifes were simply “little flutes” that were hastily assembled from leftover pieces of boxwood. They feature a thick-walled, straight body with a slightly conical bore. In this particular fife, there is an obvious warp running up the middle portion of the body which, combined with a large knot in the upper lateral area, rendered this piece of wood unsuitable for use in flutes or other woodwinds. Metzler, too, utilized small, even tone holes that were somewhat larger than Eisenbrandt’s but not as carefully placed. They are smoothed but do not appear to be undercut, although the embouchure is (this improves volume, an important feature of the military fife). The ferrules are made from sheet brass, each decorated with two sets of scored parallel lines. 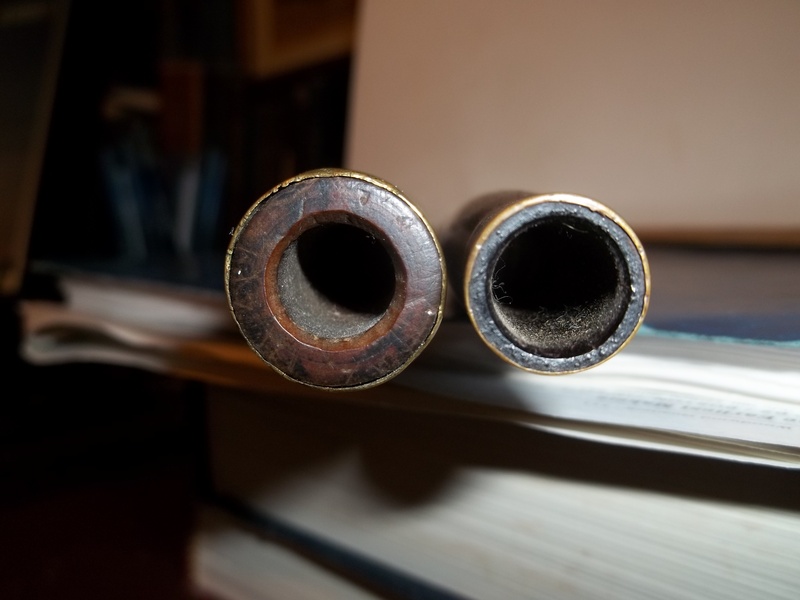 Both are loose; while this can occur with age as the wood dries out, it can also result from a poorly rolled ferrule. Metzler evidently doubted the integrity of these ferrules, as he pinced the upper ferrule twice (4 indentations) and the lower 3 times (6 indentations), thus doubly and triply ensuring that a loosened ferrule would not slip off (Eisenbrandt pinced his only once). The foot ferrule measures a full inch, the head ferrule an 1/8” less. The brand mark, “V METZLER / LONDON” is inscribed within a customized banner and carefully placed low on the body in the midline. 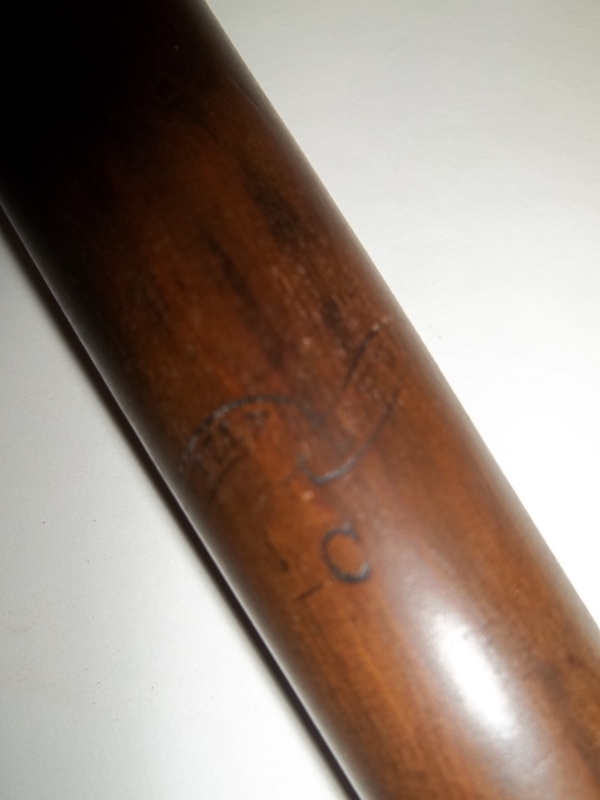 It is this mark that verifies construction well within the period of the War of 1812, before the company became Metzler & Son and thus dropped the “V” from the maker’s mark. While well constructed according to the standards of its day, the Metzler fife, with its inferior wood, loosened ferrules, and indifferently placed tone holes, reveals the London makers’ typical disdain for the fife as a true musical instrument worthy of their time and trouble; to them, fifes were simply military signal instruments whose small market held little profit potential. Therefore, they conducted fife-making with only minimal professional investment, often using damaged wood pieces that would otherwise be discarded. Things began to change, though, around mid-century with the development of the keyed fife, this in response to a larger and more profitable demand for a more flute-like fife from the “corps of ‘drums” market. In America, where professional woodwind makers were joined by cabinetmakers and just about anybody else with a lathe in making fifes, the disdain was less intense but present nonetheless. 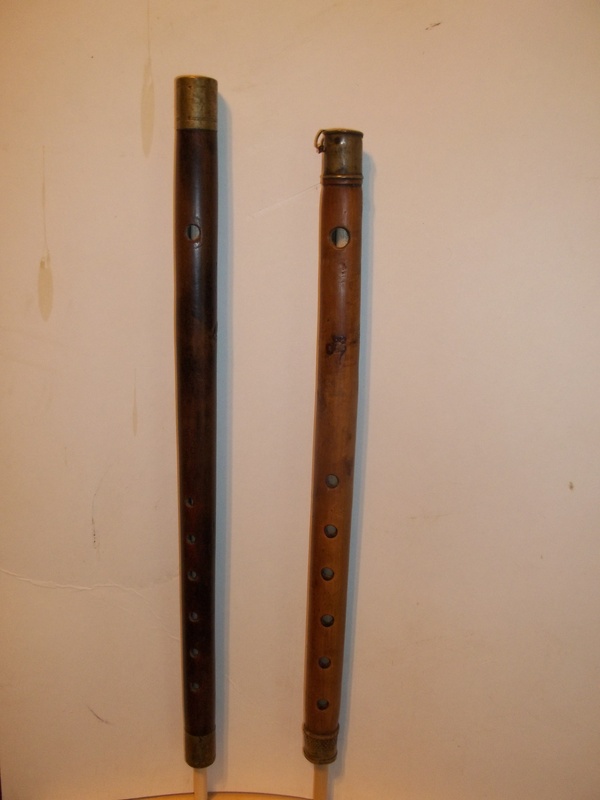 Here the military fife remained the flute’s poor relation until about 1880, when Geo Cloos, Inc of Brooklyn, NY introduced the Crosby Model fife. The Metzler fife, left compared to an unmarked British fife, ca 1775-1800, possibly Longman & Broderip, London. Both instruments lack the quality of the flutes, clarinets, and other woodwinds produced by these makers. Author’s Collection. The value of the Metzler and Eisenbrandt fifes lies not only in their presumed use during the War of 1812. Their brand marks allow us to date them as definitive examples from this specific period with equally specific construction characteristics that can be compared to other, unmarked instruments so that these, too, might be dated with a fair degree of certainty. Copyright, August 2012, History of the Ancients Dot Org. All rights reserved. This entry was posted in Musters, Jollifications, Parades, and Other Fun Stuff and tagged All About Fifes. Bookmark the permalink. I have a fife that says “B” above “Metzler/London” and slightly lower on the body,”Townsend/Manohb”, I think…it’s hard to read. It apparently had a brass fitting that is broken off (a key of some type?) just above the foot end. There is a small nub just above where the foot ferrule used to be. Any idea of this fife’s age? Of course, I would have to see the mark to be sure. Is what you have a fife? or a flute? Is it boxwood or another kind of wood? Any way you could post pictures? I’d love to see it! Looking at the mark more carefully using a magnifying glass I can see that what looked like “Manohb” is actually “Manchr”, the brand mark is very light. So as you suggested, “Townsend/Manchester” is correct. I’m not familiar with the appearance of boxwood. Maybe the pictures will help identify the wood. I don’t know whether this instrument would be classified as a fife or “band flute” because of the key that it had when new. The additional hole was plugged with a nub of wood instead of trying to replace the key at some point. The fife/flute is 16 1/8th inches long. 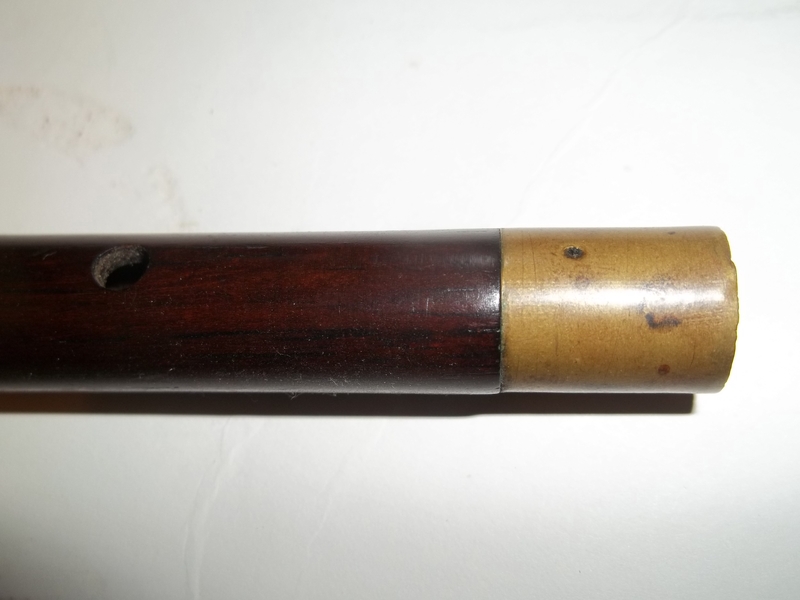 My Grandmother told me once that this “flute” was played at the shipboard wedding of two of my ancestors during their emigration from England to America in the 1860’s. How do I post the pictures? I’ll try sending the photos of the this fife/flute this way. It may take four e-mails because of the size of the files. Can you let me know what is the proper classification for this woodwind. Photo #4. Can you tell what kind of wood this instrument is made of from the photos? Ha, ha nor is it mine. Why they let me near anything with a plug is beyond me. Try sending them to this email: CTFifer@hotmail.com. If you can, take a picture of the instrument against a yardstick or ruler so I can see how long it is. I know you said the maker’s mark was lightly impressed and hard to read, but see if you can’t get a shot or two of it. If there are ferrules (those metal bands at the ends) I’d like to see those, too. I’m very sorry, but everything I’ve sent to CTFifer@hotmail.com (and i’ve sent a bunch, trying different approaches) comes bouncing right back…undeliverable. I really want to send you these pictures. Any other ideas? Do you need me in the CTFifer address book, possibly. Maybe that e-mail address thinks I am spam. I don’t look anything like spam, really! If you see this, please e-mail me. I haven’t been able to send you anything on CTFifer @hotmail.com. It all bounces back. I really would like to send you the photos of my old flute or fife, whichever it is. Is there such a thing as a fife with one key at the foot end? Does the key make it a flute? Yikes, are your pictures too large? Sometimes the email client, when confronted with huge files, will just give up rather than attempt to process them. Just sent you a private note regarding DropBox. Pretty sure that will work, even with large files. Regarding your question about keyed instruments, it depends on several factors such as when it was made, who made it, where it was made, how it was used, and, of course, pitch. I can be more precise when I see the images, especially if you take one with a yardstick or ruler placed near the fife (or flute) to show its length. Also, see if you can include one of the bore (looking up the foot end and another looking down the head end) along with a measurement of the inside diameter. ctfifer@hotmail.com .10 years ago ,I purchased a fife at a farm auction in Caruna Indiana. The note taped to the fife read ,this fife was played in war of 1812.The note was written by the owner of the fife in 1952 as it was submitted to a county far in the area at that time.In researching I found articles on the Eisenbrand and Metzler fifes ,mine almost matches the Eisenbrand fife in every detail but there are no identifying marks as for as I can see. The fife is in excellent condition. Im trying to find out a little more info on it .Would you be willing to loo at pictures .Thanks .Ron theisen 517 214 6464. Thank you for reading, and I would love to see pictures of your fife! Please feel free to send them to the hotmail address. If you could take a shot of the entire fife with a ruler or yardstick beneath, that would be great, as well as close-ups of the ferrules and embouchure, plus a shot of all six tone holes (together, not separately). So many of these early instruments have no maker’s mark, but sometimes it was impressed very lightly, has worn nearly away, or is otherwise hard to see. Just to be sure, have you looked under a raking light with a magnifier? Thanks again, looking forward to the pics!